Bungie unquestionably changed the shape of the console FPS when they partnered with Microsoft and released Halo exclusive to the XBOX. That partnership ended in 2007, and now it looks like they are teaming up with Activision, a publisher hemorrhaging talent after the Infinity Ward fiasco. Kirkland, WA and Santa Monica, CA – April 29, 2010 – Bungie, the developer of blockbuster game franchises including Halo, Myth and Marathon, and Activision, a wholly owned subsidiary of Activision Blizzard, the #1 online games publisher (Nasdaq: ATVI), announced today that they have entered into an exclusive 10-year partnership to bring Bungie’s next big action game universe to market. 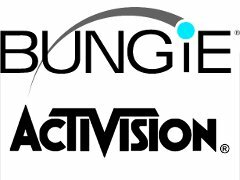 Under the terms of the agreement, Activision will have exclusive, worldwide rights to publish and distribute all future Bungie games based on the new intellectual property on multiple platforms and devices. Bungie remains an independent company and will continue to own their intellectual property. Additional terms of the agreement were not disclosed. The groundbreaking alliance will provide Bungie its first such partnership since splitting off from Microsoft in 2007, significantly broadening its global reach by providing the resources and support to develop, distribute and release games worldwide on multiple platforms and devices. Activision will broaden its portfolio with a new franchise from one of the industry’s most creative, successful and proven studios, whose games have sold more than 25 million units worldwide. To date, Bungie’s Halo games have generated approximately $1.5 billion in revenues, according to The NPD Group, Charttrack and GfK. Activision expects this agreement to be accretive to its operating margins as of the release of the first game. This is a fairly impressive revelation. Ten Years is a long time. Hell, you could almost make Duke Nukem Forever in that amount of time. And no more platform exclusivity means that Bungie has the potential to reach a far larger audience. The real question here is whether or not the developer can make lightening strike twice with this new IP, and whether Activision will treat them right or make another Infinity Ward style blunder.